When you think of cabins and Illinois, a certain U.S. President pops to mind. The log cabin was a big part of Lincoln’s appeal, in terms of coming from modest beginnings, and it’s still one of the things that most people seem to remember about Honest Abe. You can even visit a replica of the cabin he grew up in at the Abraham Lincoln Presidential Library and Museum in Springfield. But for most of us looking for a cabin, we’d like to go a little more upscale. Of course, there’s nothing wrong with going rustic when experiencing the outdoors, but there are certainly some 21st Century amenities that are nice to have. Well, at least 20th Century amenities. Fall is a great time for cabin camping. The cooler nights make tent camping a little more difficult, but the fall colors (and lack of mosquitos) make it an excellent time to explore the outdoors. So why not go full-Lincoln this fall and find a cabin to help you enjoy the get the most out of an outdoor weekend? Here are five sites for cabins in Illinois that offer plenty to do during the day and warm, cozy place to rest at night. attracting more than 2 million visitors a year. While Illinois has a deserved reputation for its flatness, Starved Rock features 18 canyons that were formed by melting glaciers. You’ll find impressive rock formations, wooded hiking trails, waterfalls and scenic lookouts atop sandstone bluffs that, quite frankly, make you wonder how this all got to central Illinois. As you might expect, reservations for the cabins book up quickly, so make plans in advance to snag one. 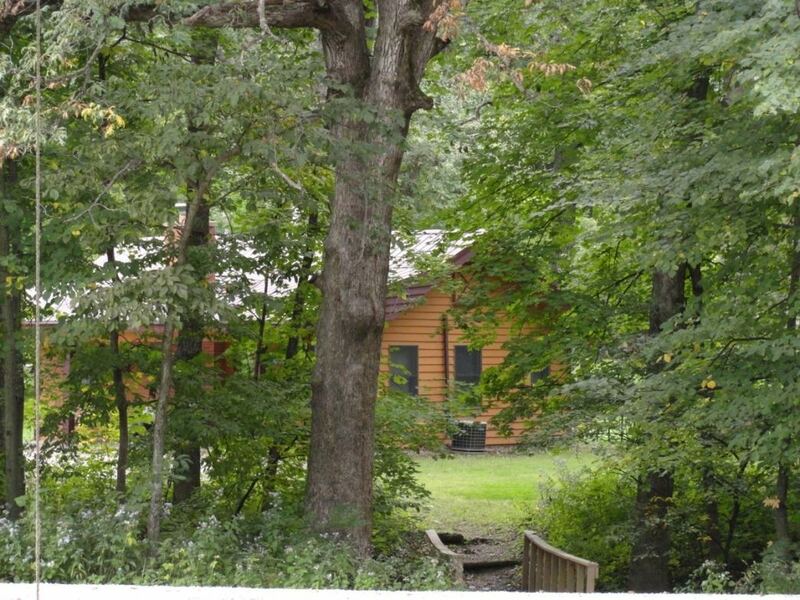 This 55-acre property close to Starved Rock features 17 cabins that are just what you’re looking for if you have any reluctant campers in your group. These dwellings are for the most part luxury cabins, which means fully equipped kitchens, covered porches, indoor wooden stoves or gas fireplaces—and some even have whirlpools. Choose from a cozy, romantic cabin for two or a large family cabin with two bedrooms and two bathrooms. 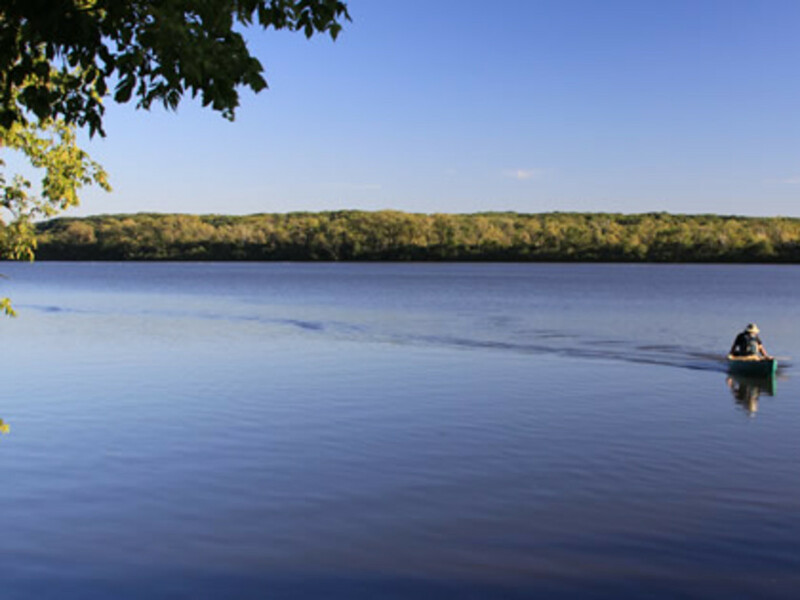 With its location near Utica, IL, Kishauwau is a short drive from four state parks—Starved Rock, Matthiessen, Buffalo Rock and Illini, all of which offer plenty of outdoor activities including hiking, paddling, fishing, mountain biking and trail running. Established in 1927, the White Pines Inn is located next to the White Pines State Forest , about two hours due west of Chicago near Oregon, IL. It features 25 one-room cabins, each with a gas fireplace and a hand-hewn log bed frame with a queen-size mattress and double-trundle bed underneath. Each cabin also has it’s own private bath. Larger groups can choose from the 12 cabins that are connected in groups of four under one roof. Each has it’s own private entrance and amenities, but interconnecting doors allow larger parties to stay together. You’ll also find modern amenities in the cabins, including heat, air-conditioning, phones, mini-fridges, TVs and DVD players. For dining, the White Pines Inn features the Lodge Restaurant on the property, an impressive wood-cabin structure with even more impressive food. The restaurant serves breakfast, lunch and dinner six days a week, but the real treat is the Cornhusker Buffet on Sunday from 8 a.m. to 2 p.m. You’re guaranteed to have plenty of calories to burn hiking the rest of the day. As for the hiking, the White Pine State Forest offers eight different trails most of which are under a mile long, making it perfect for families. 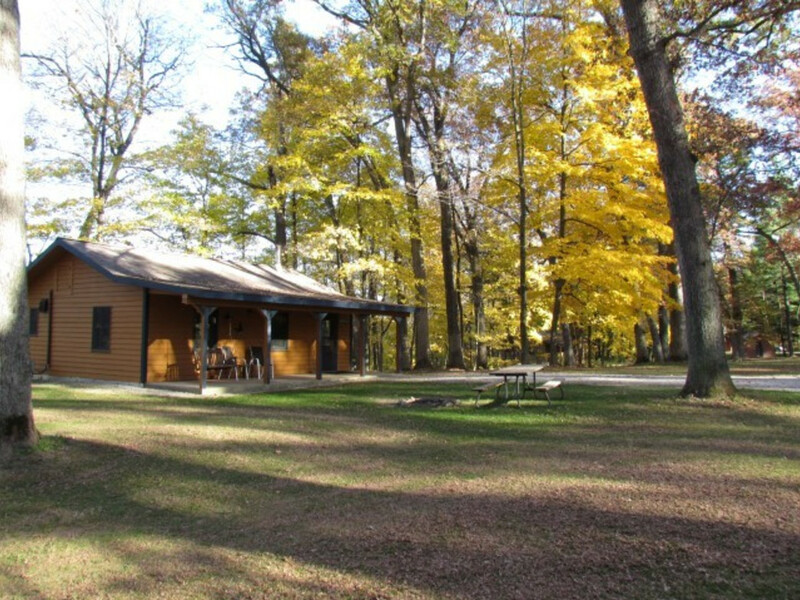 The state forest also offers areas for fishing, picnicking and outdoor camping. This year the Cook County Forest Preserve finally opened up its facilities for camping. 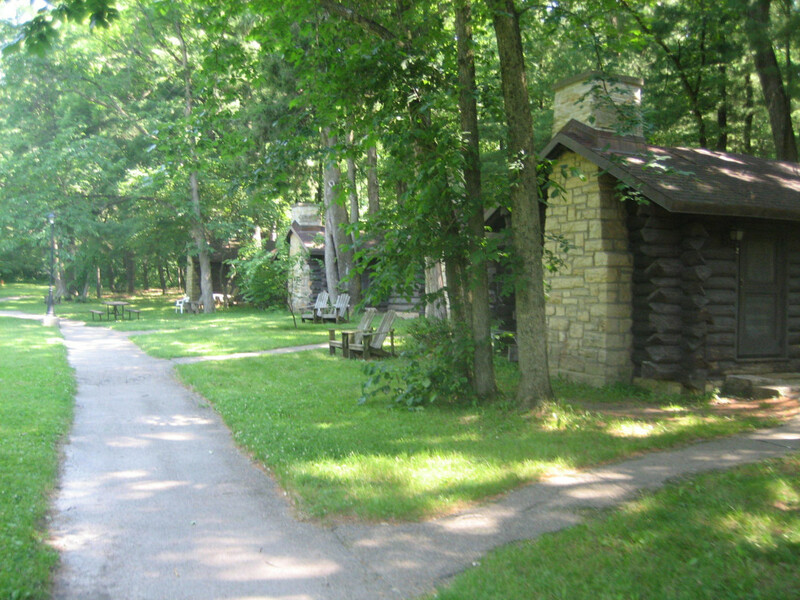 Previously, only the scouts and other organized groups could use the forest preserve facilities. For those looking to hike, mountain bike and trail run relatively close to Chicago, Camp Bullfrog Lake can’t be beat. Located within the Palos Trail System, Camp Bullfrog Lake features year-round camping with access to the Palos trails as well as water-based recreation on Maple Lake. It’s only half an hour from downtown Chicago (not accounting for rush-hour traffic), and gear-rental is even available for city-dwellers who haven’t splurged for outdoor equipment yet. In addition to the 30 sites for tent or RV camping on the property, Bullfrog Lake features three large cabins and eight small cabins. The large cabins feature bunk beds for eight people in addition to a separate room with two single beds. They’ve all got heating and air conditioning as well as a bathroom with a shower, a porch, picnic table and fire ring. The small cabins are simpler, with no heat or AC, and feature eight bunk beds in a single room. Through the end of October, the forest preserve offers campfires on Friday and Saturday nights, in addition to guided afternoon activities and camping-skills demonstrations.